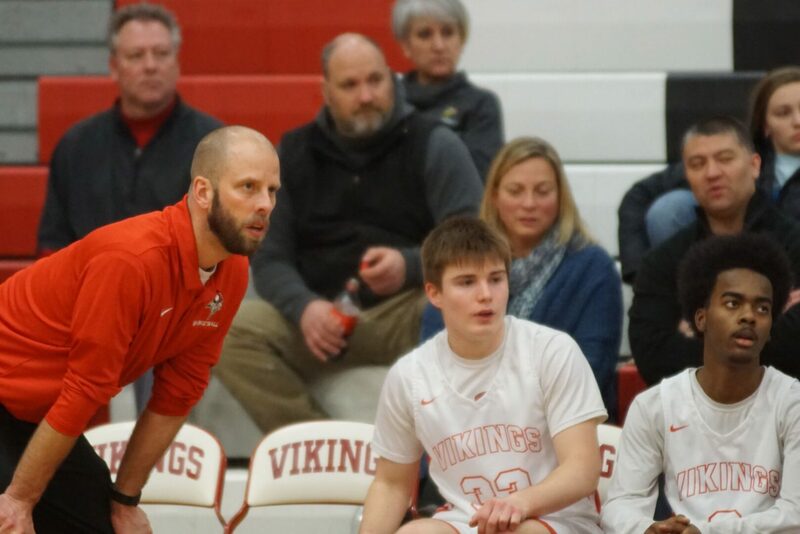 The 2018-19 season marks Nate Aardema’s tenth as head coach of Whitehall’s varsity boys basketball team. And it’s been his most challenging season so far. Part of that has to do with his young team’s performance. After a second place finish in the West Michigan Conference last season, and back-to-back league titles before that, the Vikings scuffled to a 9-10 regular season record during the regular season. Whitehall opens district play Monday night against Fruitport. But there’s more to it than that. Since last October, Aardema has been dealing with a barely functioning left vocal cord that has left him with just 20 percent of his normal speaking voice. He describes his new voice as “gravelly sounding,” and says he has difficulty projecting his voice – a significant impairment for a coach. The cause of Aardema’s voice loss remains a mystery. He has been to two ear, nose, and throat specialists, but they haven’t been able to explain why the vocal cord stopped working. “It’s basically just a lazy vocal cord that’s not fully functioning,” Aardema explained. Doctors have said that resting the voice is not a solution, and that Aardema is not at risk of losing or damaging his remaining voice. He’s had several sessions with a Muskegon-area voice therapist, when his schedule allows, but mostly he’s working on his own to maximize the use of his remaining voice. He compensates for his voice loss by using a microphone during team practice sessions. It’s not a perfect solution, because the sound system isn’t very clear and often makes his instructions sound jumbled. But he says it helps. Game days present the biggest challenge, when all the game-related noises sometimes make it impossible for Aardema’s players to hear him. “It’s been frustrating, because I’ve typically been pretty vocal during games, yelling encouragement – although it’s debatable if yelling and screaming makes a difference,” Aardema said with a small laugh. Aardema’s voice loss isn’t a secret around the West Michigan Conference, though most assume it’s a simple case of laryngitis. Referees, of course, don’t mind the idea of a coach with limited vocal capabilities. When Aardema meets with refs before a game, “they often joke that this is going to be their favorite game they’ve ever worked,” he said. During games, Aardema counts on his assistant coach of four years, Nate Baker, and Whitehall JV coach Christian Subdon, to relay messages to players and referees. That works pretty well, because both men know Aardema’s program and what he likely wants in a given game situation. “It’s definitely a team effort,” Aardema said about his assistants. “My philosophy is that every team member, up to the coach, is either giving energy or taking energy. I try to give energy,” he said. Complications from the voice loss also carry over into Aardema’s day job as a fourth grade teacher at nearby Montague. It’s his first year with the district, which happens to be Whitehall’s biggest sports rival. He uses a microphone while teaching, something that has become a common practice in education. Still, Aardema finds it a challenge to get and hold his students’ attention. All of the changes have left Aardema feeling less than whole, and searching for answers about how he can adapt his coaching style to help make the Whitehall boys’ varsity basketball team successful. The Vikings are going through a rebuilding year with three sophomores on the varsity squad, two more than any Aardema team has ever had. And Aardema’s voice limitations have forced older players to take more of a leadership role on the court, while the younger players learn the system. Senior Terrell Harris has played under Aardema for three years and said he knows what the coach is trying to say and what his expectations are. Fellow senior Ethan McKenzie agrees. 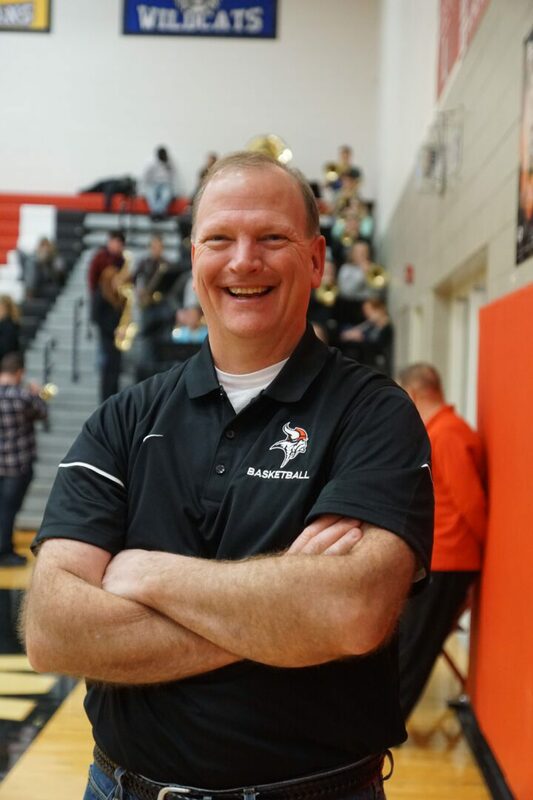 Whitehall Athletic Director Greg Russell has been watching all of this unfold, and understands that this has been a difficult season for Aardema. Russell has been with the district for 32 years – 25 of them as athletic director – and has known Aardema since the coach’s high school days. “I know he’s really frustrated for the right reasons,” Russell told LSJ. “Nate’s one of those coaches who likes to be involved when he’s coaching, not just sitting on the sidelines. Nate bleeds passionately for Whitehall. He cares not just about the product on the floor, but how he and the team are perceived in the community. Aardema graduated from Whitehall in 1998 and was a self-described “mediocre” player under former basketball coach Mike Rohen. He credits Rohen, who passed away of a brain aneurysm in February 2000, with encouraging him to pursue a career in education and coaching. Shortly after graduating high school, Aardema was back in Whitehall, serving as an assistant coach for Rohen while also attending Muskegon Community College. He eventually transferred to Western Michigan University, then returned to the Whitehall district as an assistant coach in 2004, working for and learning from coaches Troy Love, Jeff Duncan and Tony Annese. Aardema entered the current season with an overall record of 121-68. He said much of his coaching philosophy and style are based on what he learned from Rohen and Annese. That includes not only a commitment to playing hard and competing every minute of every game, but also to being respectful of the referees and exhibiting behavior that reflects well on the team. Aardema’s doesn’t believe his voice loss will be a permanent condition. He believes that therapy will eventually remedy it. One thing seems certain – it will take more than voice problems to derail his coaching career. He’s gotten support from assistant coaches, players, the Whitehall community – even from opposing coaches. During a recent game against Montague, Aardema was having trouble getting the referee’s attention to call a time out. Montague coach David Osborne got the ref’s attention for Aardema, effectively calling a time out for Whitehall. That kind of camaraderie means a lot to Aardema, and exemplifies what athletics are all about. “What do sports teach us? To take any adverse situation, adapt and overcome it,” he said.